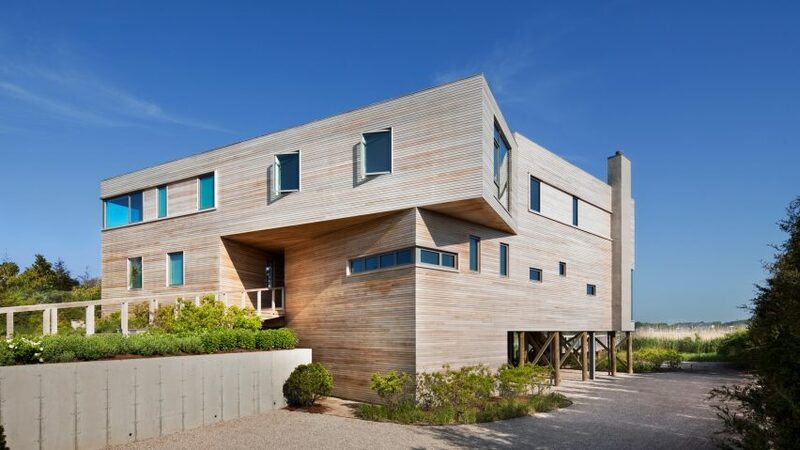 This cedar-clad villa in the Hamptons designed by New York City architects Leroy Street Studio is raised on timber pilotis to anticipate flooding. 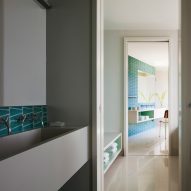 Named Bay House, the six-bedroom residence is comprised of two angled wings that open out towards the ocean. The two halves of the home join at its centre, above a ground-level breezeway that frames views of the water. 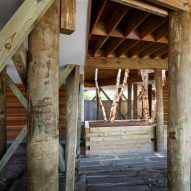 "The site, located on a barrier island, sits within a long line of properties that have eliminated sensitive tidal wetlands and replaced native vegetation with lawn and bulkheads," said Leroy Street Studio. The studio sought out a different approach for this property, choosing to restore the plant life and wetlands, returning the site to its natural state. Raising the property above the water provided an unforeseen design opportunity. "The new stricter regulations that mandated a higher flood elevation and elevated septic system also created an opportunity to play with the contrast of solid massing and open piles," said the firm. Visitors access the property through a set of slow steps leading to a central opening in the facade. 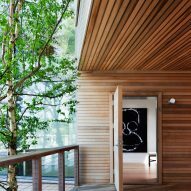 This breezeway opens out onto the home's deck, which acts as the focal point of the residence. 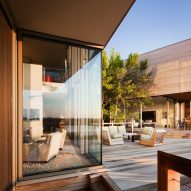 The expansive deck extends over the water and forms an outdoor common space between the two wings of the house. From here, visitors can access the main living room in the east wing of the home, and a cabana located in the western half. Three flights of stairs lead to the upper level, which contains smaller social spaces for the family as well as several bedrooms. A large opening allows residents to look down into the double-height living room below. The architects positioned windows to provide views of the ocean, but limit exposure to the adjacent properties. "Storage elements and built-in furniture, including a desk and wine-storage wall, are built into the perimeter to add to the feeling of enclosure," Leroy Street Studio said. "Small windows are punched through the protective veil to frame intimate views." Light tones with wooden accents characterise the interiors. 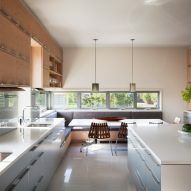 The architects chose furniture that reflects a mid-century modern sensibility popular in the Hamptons – a popular getaway for wealthy New Yorkers. Another property in the area is similarly elevated to avoid flooding, while other houses nearby include a dwelling based on a historic lifeguard station and a cedar-clad cottage with a pointy extension.